Group BTS will hold their fifth official global fan meeting in Seoul and Busan. "BTS's 5TH MUSTER [MAGIC SHOP] will be held at Busan Asiad Auxiliary Stadium on June 15 to 16 and at Seoul Olympic Park Gymnastics Stadium on June 22 and 23. 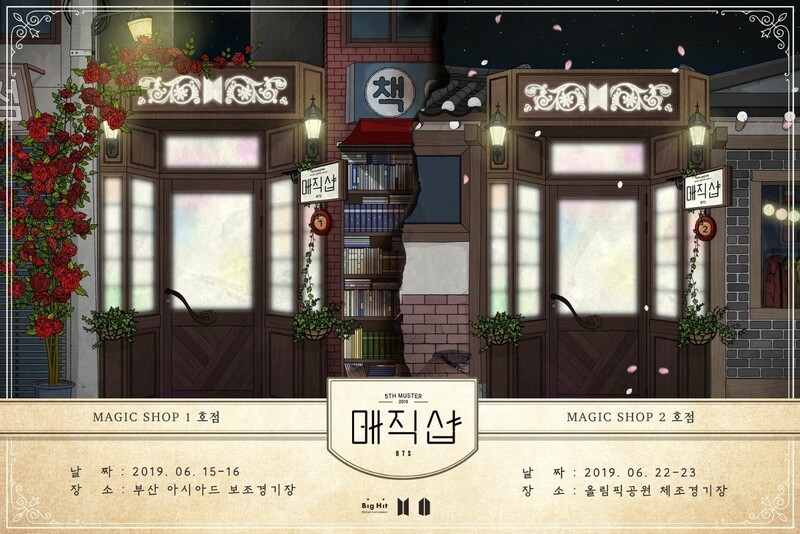 The fan meeting poster was unveiled together, features doors into "Magic Shop No. 1" and "Magic Shop No. 2," giving a mysterious impression. The global fan meeting will cover five Ami, BTS' official fan club. BTS previously released teaser videos and photos that heralded the hosting of the fan meeting on Instagram's official account, drawing attention from fans around the world. BTS unveiled their comeback trailer "Persona" on April 28 ahead of MAP OF THE SOUL: PERSONA's worldwide release on April 12, raising expectations for its new album.